This budget year, Virginia is spending $4.9 billion on transportation, including $4.1 billion on roads. However, the state’s 17.5 cents per gallon gasoline tax will raise just $961 million. The difference is made up by other state revenue and federal aid, and that’s before taking into account a seeming bipartisan state consensus to spend more on transportation. One would think, then, that the answer is to index the gasoline tax for inflation. 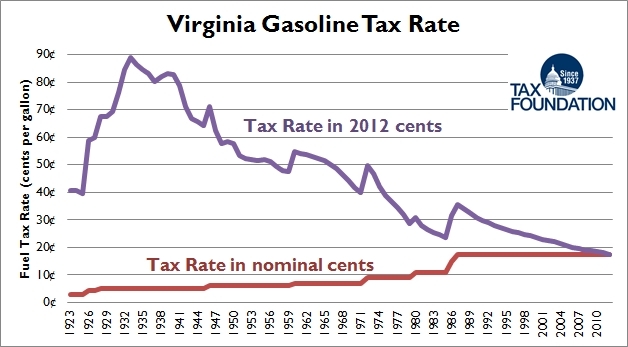 After all, Virginia’s gas tax is lower than all surrounding states, and when accounting for inflation, the tax is currently the lowest it’s been since it was first enacted in 1923 (see Figure below). Perhaps a case could be made for greater use of tolls or vehicle mileage taxes or car taxes, but everyone agrees that good roads funding policy means having the road user pay for further improvements. Not everyone, apparently. 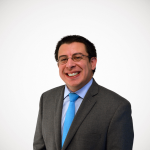 Delegate Tim Hugo (R-Fairfax) has floated scrapping the gas tax entirely and replacing it by raising the state sales tax from 5.0 percent to 5.9 percent. Moving away from user-like taxes toward general funding sounds like a terrible idea, and it’s unclear why it would even be suggested until one remembers Virginia’s regional divide. Put simply, northern Virginia (the D.C. suburbs and exurbs) is where there’s the most demand for additional transportation spending. I’m guessing the thinking is that a higher gas tax would subsidize northern Virginia at the expense of drivers elsewhere in the state. A higher sales tax would too, but the higher level of sales activity in northern Virginia would mean more of the revenue would be generated in that region. I can’t speak for Fairfax Del. Hugo’s motivations, but the regional divide is the best explanation for his tax swap idea. Or maybe it’s the classic conundrum: wanting transportation spending but not so much that you actually want to pay for it. There’s a petition against tolls in the Hampton Roads area. Governor McDonnell (R) is set to announce $500 million more in general fund transfers to pay for transportation. The state has put just $275 million into the $5.5 billion Metro extension from Falls Church, Va., to Dulles International Airport in Loudoun County, Va. A referendum for a higher local transportation sales tax in the Hampton Roads failed a decade ago, and an equivalent in northern Virginia that was sloppily drafted to avoid a public vote was ruled unconstitutional. So if good policy is impossible, maybe Del. Hugo was willing to try anything. To corrupt Occam’s razor, perhaps the best answer is the simplest. The 3 cent per gallon gas tax Virginia adopted in 1923 is worth 40 cents per gallon today due to inflation. Officials should consider letting the tax return to that level, either statewide or just for northern Virginia. Coupled with targeted highway tolling (which at least one poll suggests the public prefers), and perhaps a northern Virginia transportation sales tax, Virginia officials could solve their transportation financing woes in a manner that all Virginians will find fair.